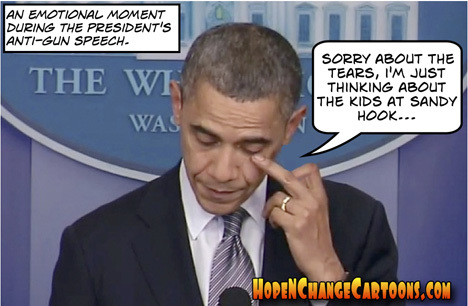 Barack Obama, surrounded by kids, spoke to the American people on Wednesday to tell them about the many gun restrictions he's putting in place by Executive decree - and the larger ones he wants Congress to pass - in order to help non-aborted children live long enough to pay off the trillion-dollar debts he's running up. The president's actions were theoretically spurred by the many letters he receives from children, which is certainly credible as most of his policies appear to be directed by those who are totally unschooled in math, history, or the Constitution. Unfortunately, none of the president's announced initiatives do much other than disarm responsible gun owners, which is likely his actual objective. He failed to address, in any meaningful way, the greater problem of psychotic maniacs - who, unsurprisingly, are frequently found at the scene of mass murders (and occasionally storming our undefended consulates in Libya, or mowing down enemies of the Mexican drug cartels using DOJ-supplied weapons). The president did, however, recommend much more stringent background checks and psychological profiling for anyone who wants to buy a gun. Hope n' Change would like to suggest that in the future, that same standard should be applied to the man who controls our nuclear arsenal. Yes, everyone is getting "wee-wee'ed up" with planning for Barack Hussein Obama's second inauguration next week, and every detail is getting keen attention - unlike any policy decisions which happened during the president's first term. As one of the festive highlights, the most racist and race-baiting president of modern times will take the oath of office with his hand placed on the Bible of Republican and civil rights icon Martin Luther King Jr who, if alive today, would surely raise his face to the heavens and say, "why the hell does the president have a predator drone circling me?" Because Obama repudiates the legacy of Dr. King with every action he takes, and wants a colorblind society about as much as he wants to pay for his own vacations. 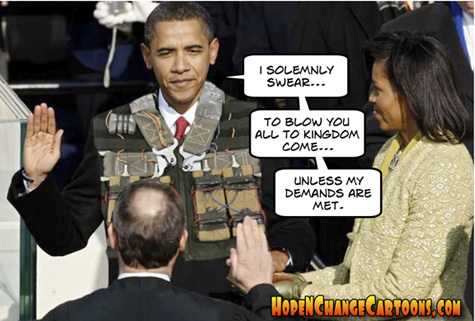 Which perhaps explains why the ceremony in which Barry uses King's Bible will be a complete charade: because his actual swearing in will take place 24 hours earlier in a private ceremony using a Bible from Michelle's family which is probably not a Koran. But instead of going back to work on Monday, all sworn in and promising to defend the Constitution, Barry wants the pomp and circumstance of a huge and expensive public spectacle which has no legal validity whatsoever. Ambassador Chris Stevens is not expected to attend.